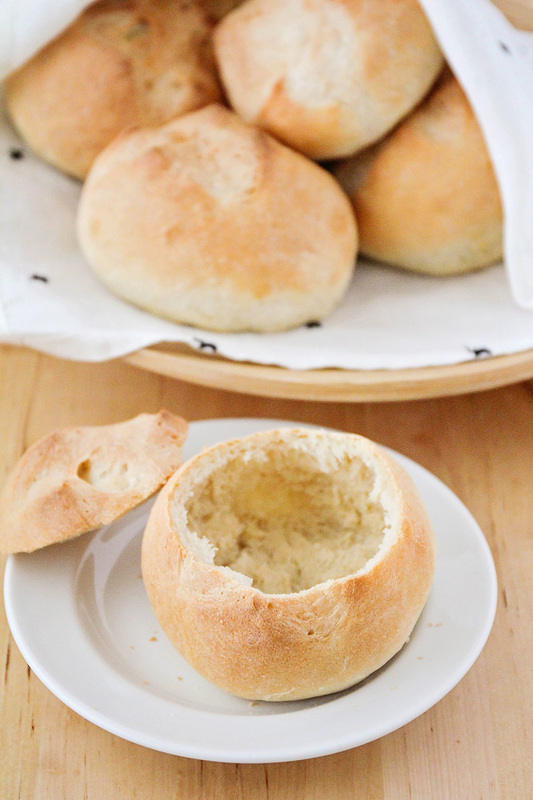 Homemade bread bowls are surprisingly easy to make, and so delicious. Perfect for soup night or for serving dips! We've had such a mild winter in Portland this year (for which I am thanking my lucky stars daily), but soup season is still going strong at my house! Even when the weather is in the 50s, and we spend the day playing outside and riding scooters at the park, there's still nothing better than a warm bowl of soup at dinnertime. If you're going to have soup, though, you definitely need some fantastic bread to go with it! While I often whip up a loaf of french bread, or some tasty buttermilk biscuits, there's something really fun about serving soup in a bread bowl! These easy homemade bread bowls are quick to make, and are the perfect complement to a delicious bowl of soup. I've been making these bread bowls for several years now, but I only recently started making them with bread flour instead of all-purpose flour. 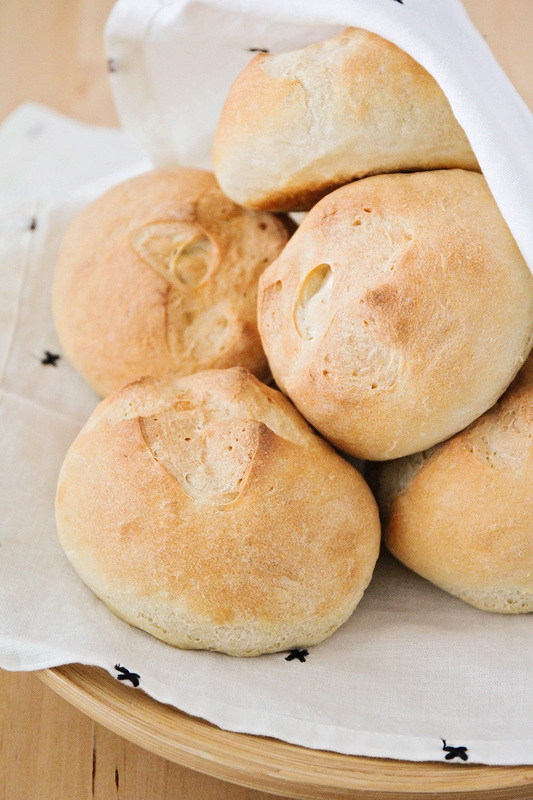 They'll still turn out great with the all-purpose flour, but the bread flour makes them extra chewy and crisp on the outside, which I totally love! I usually divide my dough into sixths, to make smaller bread bowls that are a better serving size for my kids, but I would recommend dividing them into fourths if you're serving adults. The smaller bread bowls will hold around 3/4 cup of soup, and the larger bowls will hold about 1 1/2 cups of soup. 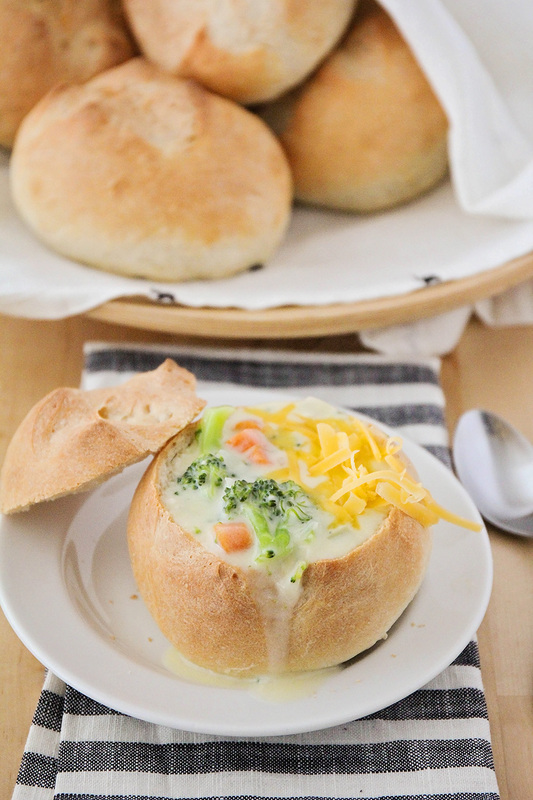 These homemade bread bowls are the perfect way to make your soup night extra special! In a large bowl or the bowl of a stand mixer, dissolve the yeast and sugar in the warm water. Let sit 5-10 minutes, or until bubbly and foamy. Add 3 cups of flour and the salt, and mix well. Add remaining flour, 1/4 cup at a time, until the dough pulls away from the sides of the bowl and is only slightly sticky to the touch. Knead until smooth, 5-10 minutes. Place the dough in a lightly greased bowl, cover with a damp towel, and let rise 30 minutes. After 30 minutes, preheat the oven to 500. Punch the dough down and divide into 4 - 6 equal sized pieces (depending on the size of bread bowl you desire). Shape each piece into a ball and place on a lightly greased baking sheet. Score the top of each piece and sprinkle with salt, then spray with warm water and let rise 15 minutes. Bake in preheated oven for 2 minutes, then spray again with water and reduce the heat to 425. Bake 16-18 more minutes, or until golden brown. Pork Verde Chili + 29 Hearty Chili Recipes!